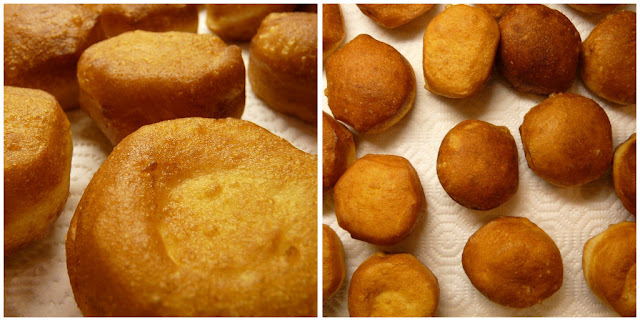 Yesterday, while browsing food blogs online like a typical foodie, I chanced upon a post by Rasa Malaysia on making "cheater donuts" using refrigerated Pillsbury dough. I could not have found it at a better time because for the last week or so, I'd been craving donuts and never seemed to have the time to stop by a donut shop. I don't eat donuts very often. In fact, I can't remember the last time I had a donut. Since this recipe sounded so easy, I thought I'd try it today. The dough: Pre-cooked on a plate and cooking nicely in the hot oil. 1. Pop open the can of dough and separate the pieces on a plate. 2. Heat oil to about 350º. You can use a deep fryer if you have one or in my case, I used my wok. When you see the oil beginning to smoke, it's a good sign that the temperature is just about right. 3. Gently drop the dough into the oil one at a time. It's important not to crowd them so that they cook evenly. In my case, I cooked them in batches of five. 4. Once they brown nicely on one side (about 20 seconds), flip them over to brown the other side. 5. Remove and drain on paper towels then sprinkle with a good amount of sugar. Serve warm. got browned a little too much but no worries, they will be equally loved and devoured. If you're cooking them in a deep pot/pan or a wok like I did, it's very important to keep an eye on them at all times and adjust the temperature accordingly. They tend to brown very quickly and could burn easily if you're not careful. In the beginning, you can start off at a medium-high heat setting so that the oil will maintain its temperature after the cold dough goes in. Once they do, turn the heat down to medium-low or even low. Once that batch is removed, you can turn the heat back up again to repeat the process. You don't need alot of oil if you cook them in small batches. I used only about 3 cups and that was more than enough. The sugared donut - up close and personal. Wow. Just, wow. 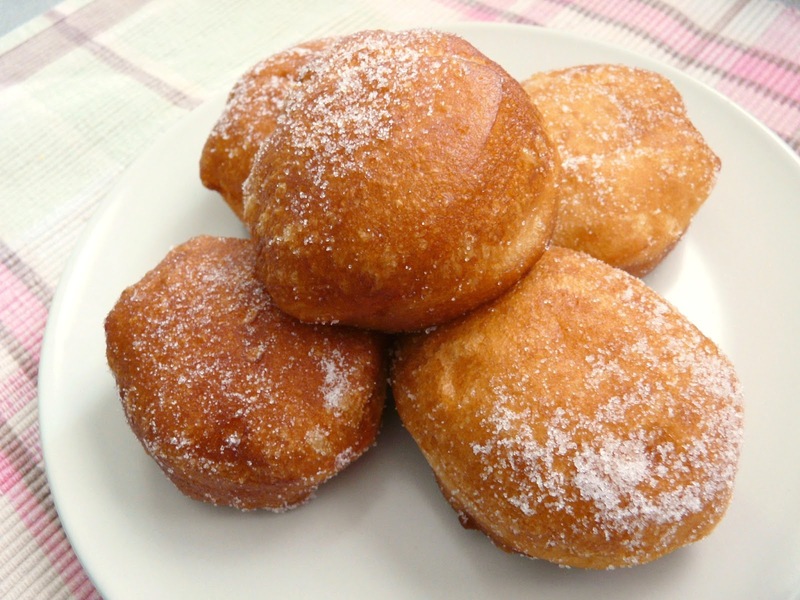 For the amount of time it took to make these donuts and the ease of it all, this recipe is pure WIN. Sure, they don't taste like Krispy Kreme donuts but boy, are they good! And they definitely do hit the spot if you're craving a donut. They are slightly crunchy from the exterior but the interior is so nice and chewy. My man gave it two thumbs up. I tried this over the weekend and really enjoyed it. I poured some vegetable oil into a small pot and set the oil temperature at 350 degrees before frying the dough for about 20-30 seconds on each side. My first batch browned quickly but the dough didn't cook all the way through. I ended up cutting the remaining dough in half then I fried the rest of the batch, which ended up looking like small half moon shapes. I think my problem was that the dough was still cold from the refrigerator. I should have waited for the dough to be room temperature before dropping them in the oil. Anyways, the donuts ended up being awesome and my family and I gobbled it up before heading to the Santa Ana Zoo. Thanks for the recipe!